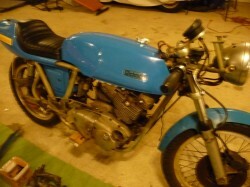 I want to apologize for the poor quality of pictures, but this 1976 Rickman BSA Rocket 3 is such a great project I wanted to share it. As regular readers will know, Rickman was a frame company that produced great frames to overcome any shortcoming of larger manufactures frames. Think your BSA frame was a little springy for its 750cc triple? Give Rickman a call. 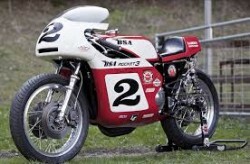 VERY RARE RICKMAN BSA TRIPLE CR ROAD RACER, BUILT IN LIMITED NUMBERS. 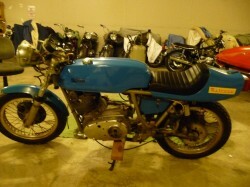 THIS BIKE WAS BROUGHT BACK FROM THE UK BY AN AIRFORCE CAPTAIN IN 1976 AND IS TITLED AS 76 BUT WAS ACTUALLY BUILT IN 1974. TITLED BY THE ENGINE NUMBER A75R 001 SERV, BELIVED TO BE A SET OF SERVICE CASES ORDERED AND BUILT FOR THE CHASSIS. 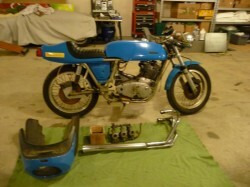 IVE ALWAYS WANTED TO RESTORE THE BIKE BUT DO NOT THINK I WILL EVER FIND THE TIME SO ILL PASS IT ALONG. THE BIKE IS MOSTLY COMPLETE AS SHOWN, THE ENGINE WAS OUT WHEN I BOUGHT IT SO IVE SET IN IT THE CHASSIS IN THE INTEREST OF KEEPING EVERYTHING TOGETHER. WHAT YOU SEE IS WHAT I HAVE FOR THE BIKE. 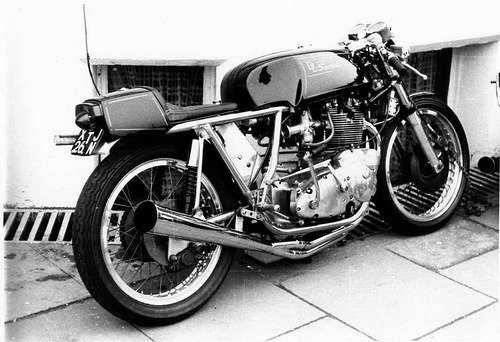 By the time the British industry had produced a Triple for the public, the world had already seen the world changing CB750. So when the combined company of BSA/Triumph finally got their triple to market, instead of game changing, it became an also ran. 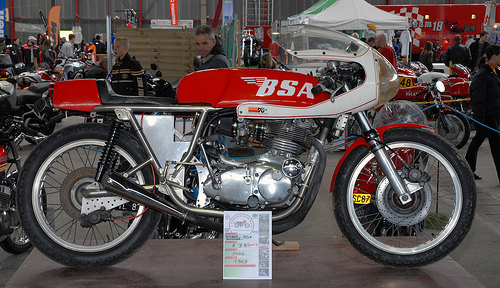 The 741cc engine offered by both Triumph, as the Trident, and BSA as the Rocket 3 generated 58hp at 7500rpm. This was good for a top speed of 120mph. Not bad for an extra cylinder grafted onto and engine design from 1939. Hi there, how much are you asking for the Rickman? site. You have some really good posts andd I think I would be a good asset. What a beauty – priceless.